and healing power of grief. 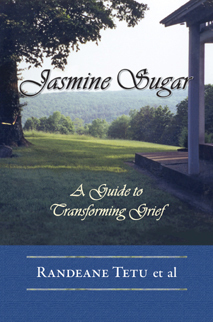 Jasmine Sugar honors the steps you take through a difficult time of adjustment in a world that is new for you. It sees what you see in sadness; it applauds your courage; it holds your hand until you see beauty again in a starry night sky and things that used to delight you. The poems acknowledge facets of grieving, the stories respect your stories, and the suggestions offer other perspectives. More than a book about grief, this practical guide provides empowerment as it shows you how to make your way with wisdom and grace and the help of your angels, guides, and teachers. "This book gently guides you on your journey of spiritual expansion. By receiving help through this book, you allow grace and love from the angelic realm to embrace you." Randeane Tetu is a Melchizedek Master, Karuna Reiki Master, and Holographic Sound Healing Facilitator who brings her teachings and learnings into this message of love.